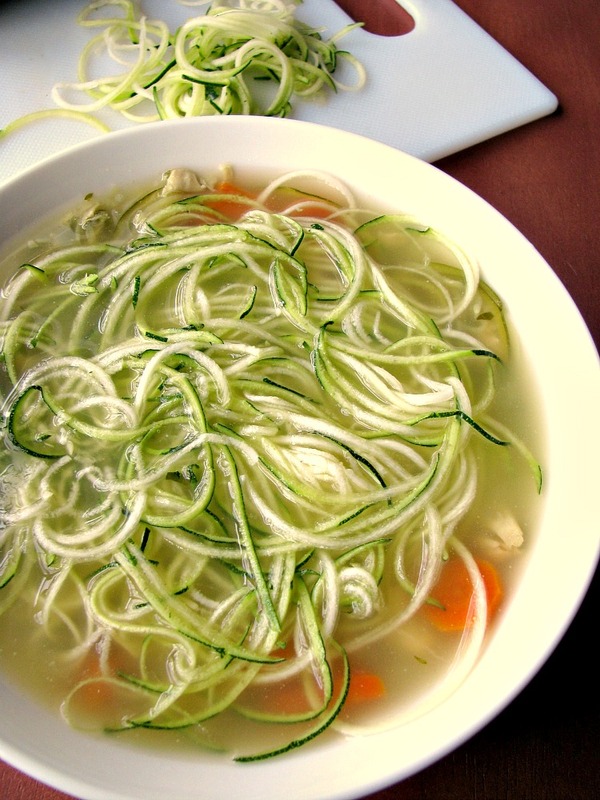 Healthy and filling, easy to make Chicken Zoodle Soup made with leftover chicken and zucchini noodles, perfect for the cold weather. I got two things for Christmas that I’m completely convinced will now go out of popularity simply because I have them, a spiralizer and a Keurig. Technically, I picked the spiralizer out myself after having thought about getting one for a long time. I always mean to cook healthier, but I admit it’s something that I struggle with. I know I could cook healthier things if it was just me and my daughter (seriously, 7 years old and she orders a salad for lunch a few times a week! ), but I haven’t completely gotten my husband away from red meat and junk food since his heart attack two years ago. So, when I do healthy I almost always do a lightened up version of something less healthy, like this Chicken Zoodle Soup. Trust me, I LOVE regular noodles, and chicken noodle soup so much I’m surprised I never shared a chicken noodle soup recipe. This Chicken Zoodle Soup is pretty much exactly the way I make it with regular noodles except I left out celery because I didn’t think it was needed with a bowl full of zucchini noodles. I used leftover chopped chicken breast that I had frozen after I made the Chipotle Chicken Naan Pizza, but if you don’t have any leftover chicken you can just brown some fresh chopped chicken breast in a little canola oil before adding it to the soup. 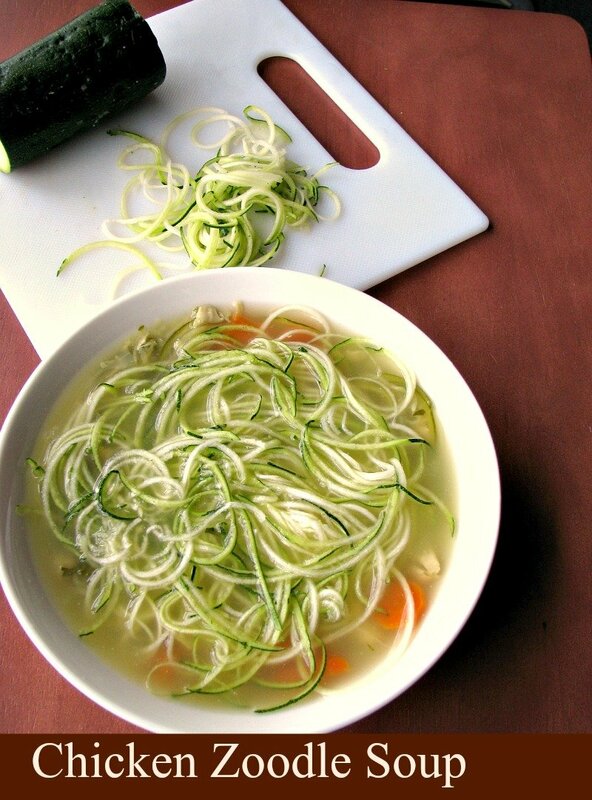 I left the spiralized zucchini as long strands like unbroken ramen noodles, but I’m sure they could be easily cut shorter before adding to the broth. 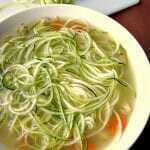 The zucchini noodles only take a few minutes to cook, making this a quick, easy, and healthy dinner that we all loved. Yes, my husband loved it, too! I admit I was a little surprised. I think if you try it, you will be surprised how much you like it as well. Combine the chopped carrots, onion, garlic, and parsley in a large pot. Add the chicken stock, lemon juice, and black pepper. Bring to a boil, reduce heat, cover and simmer for 15 minutes. Add in the zucchini noodles and the chicken, increase the heat to maintain a simmer, and continue to cook until the zucchini is tender, 5-10 minutes. Where is the “juice of one lemon”? Thanks! Hi Anne, thanks for pointing out that I forgot to include it. I added it along with the chicken stock. I’ll fix that now. I agree! Do you want me to make something else with them this week?